THE BARCELONA IS LOCATED JUST A HALF BLOCK FROM THE BEACH SO IT IS AN EASY STROLL DOWN TO THE WATER. 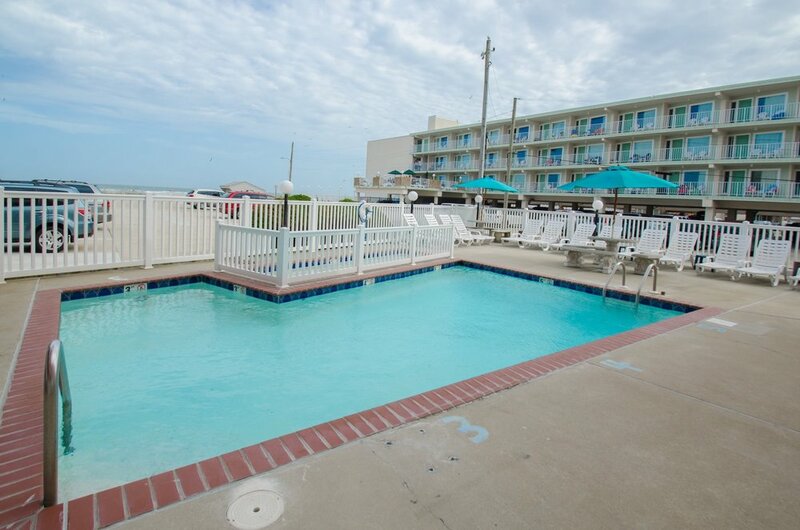 AFTER A FULL DAY AT THE BEACH COME COOL OFF IN OUR WADING POOL, GRAB A LOUNGE CHAIR ON THE PATIO AND READ A BOOK, OR FIRE UP ONE OF OUR GRILLS AND DINE-IN TONIGHT. IF THERE IS ANYTHING YOU NEED DURING YOUR STAY PLEASE DO NOT HESITATE TO ASK. WE HAVE A SMALL HEATED WADING POOL (DEPTHS OF 3FT - 5FT) FOR GUESTS TO USE ALONG WITH A BABY POOL ON THE SIDE FOR LITTLE ONES TO SPLASH AROUND IN (DEPTH OF 1FT). THE PATIO HAS THREE TABLES WITH UMBRELLAS, A ROW OF LOUNGE CHAIRS, AND A ROW OF ARMCHAIRS TO RELAX IN THE SUN. TWO GAS GRILLS ARE AVAILABLE TO USE TO MAKE A DELICIOUS DINNER AFTER PICKING UP WHAT YOU NEED FROM THE LOCAL FISH MARKETS OR GROCERY STORES. LET US KNOW WHEN YOU ARE READY AND WE WILL LIGHT IT FOR YOU AS WELL AS PROVIDE THE UTENSILS YOU NEED. PARKING IS AVAILABLE AND INCLUDED IN YOUR STAY (1 CAR PER ROOM). WE HAVE COMPLIMENTARY ICE FOR YOU TO FILL UP YOUR COOLER FOR THE BEACH OR MAKE SOME COCKTAILS FOR HAPPY HOUR. COURTESY COFFEE IN THE MORNINGS IS AVAILABLE IN THE MAIN OFFICE, STOP BY BEFORE YOU START YOUR DAY. IF YOU ARE LOOKING FOR A ROUND OF CORN HOLE, BORROW OUR SET AND LET THE COMPETITION BEGIN! IN EACH ROOM WE PROVIDE TOWELS, TOILETRIES, AND A HAIR DRYER. THERE IS FREE WIFI AND CABLE TV. ALL ROOMS HAVE MINI FRIDGES, A MICROWAVE, AND A SEPARATE AIR CONDITIONING UNIT SO YOU CAN CONTROL YOUR COMFORT. WE HAVE BLACKOUT CURTAINS FOR THOSE MORNINGS WHEN YOU ARE JUST NOT READY TO START THE DAY WHEN THE SUN IS. PLEASE SEE OUR ROOMS PAGE FOR MORE SPECIFIC DESCRIPTIONS OF EACH TYPE.